This cake was inspired by so many things, I don’t know where to start. Actually, I do. Paris. Denise Acabo’s shop, A l’Etoile d’Or. Mr Genin’s caramels lined up on the white marble counter top. Mango and passion fruit caramels, to be specific. New Year’s Eve dinner party at my friends’ house has been a tradition for over 10 years and I’ve been baking cakes for the occasion for the last three. Come December, I start thinking about the tastes that inspired me the most that year. This year, it was first the mango and passion fruit caramels at A l’Etoile d’Or and then the Mogador macaron at Pierre Herme. 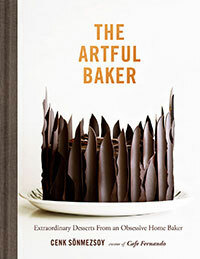 Another inspiration for this cake is the “Baking with Julia” DVD. The episode where Julia and Alice Medrich bakes the chocolate raspberry ruffle cake, to be exact. 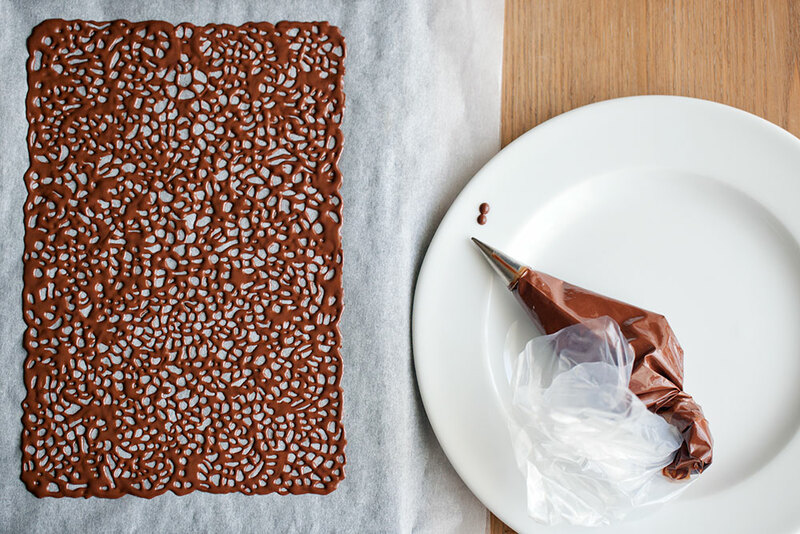 Watching Alice bake that cake and prepare those chocolate ruffles is truly an inspiration. 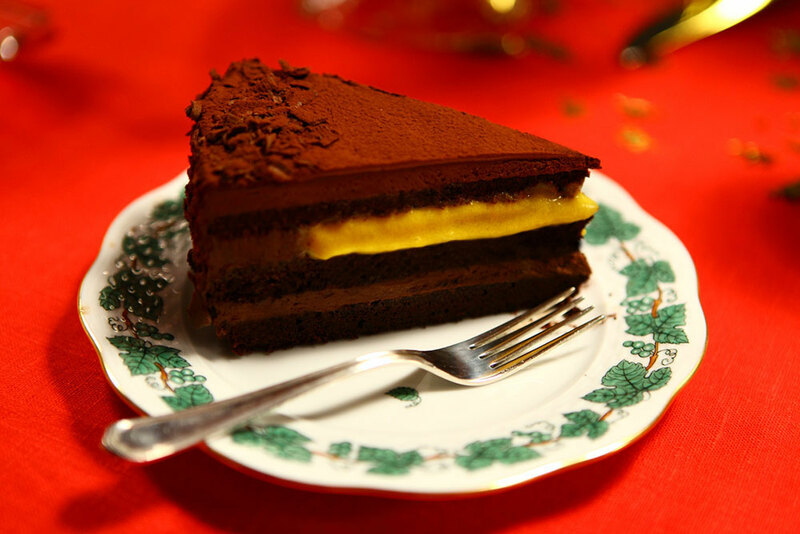 I baked the cake layers according to her chocolate genoise cake recipe and spread rich chocolate ganache layers and a surprise mango passion fruit curd layer in between. It was like eating a Mogador macaron, but richer and definitely more chocolaty. 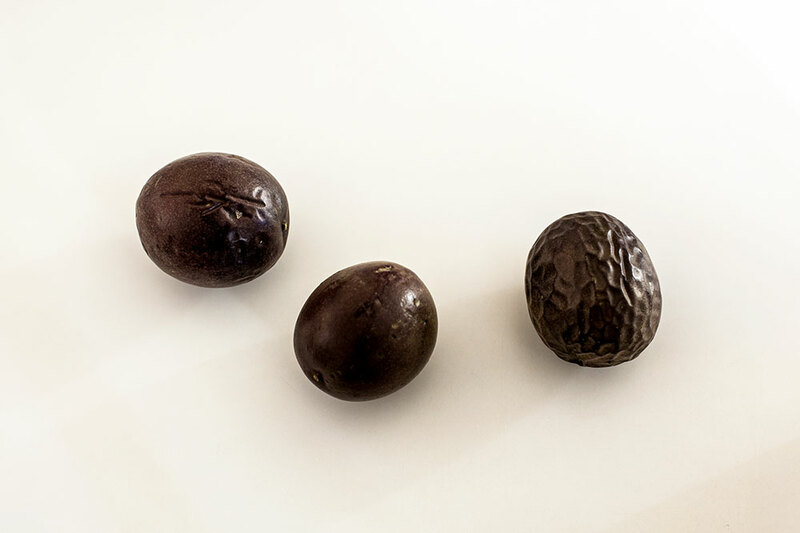 Above is a photo of a passion fruit in different stages of ripening. The one in the middle is how it looks on the day I bought, the one on the left a few days later and the one on the right after a week of sitting on my kitchen table, perfectly ripened. And this is how they look once you cut them in half. The passion fruit curd recipe I’ve found at Rose Levy Beranbaum’s new book “Rose’s Heavenly Cakes” is a winner. Rich, smooth and a high concentration of passion fruit flavor. I had trouble with the consistency at first (too thin), but took care of it with a couple tablespoons of cornstarch. 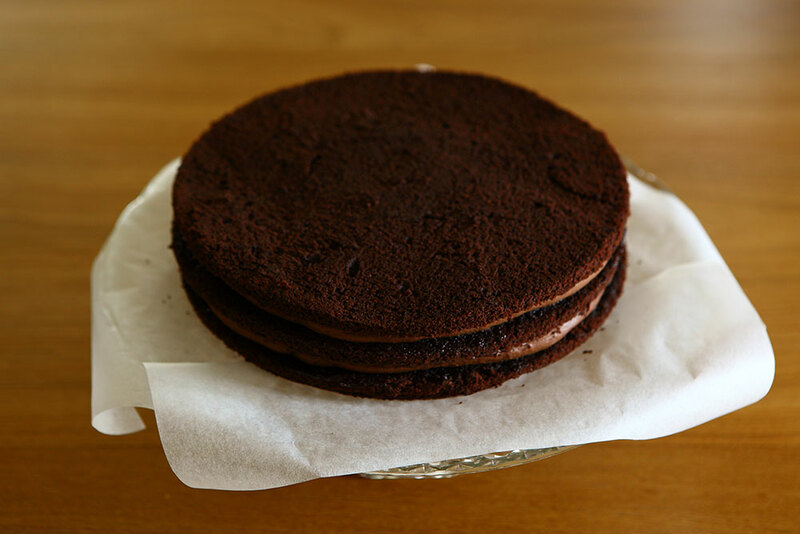 And here it is: Alice Medrich’s chocolate genoise cake, cut into three layers. 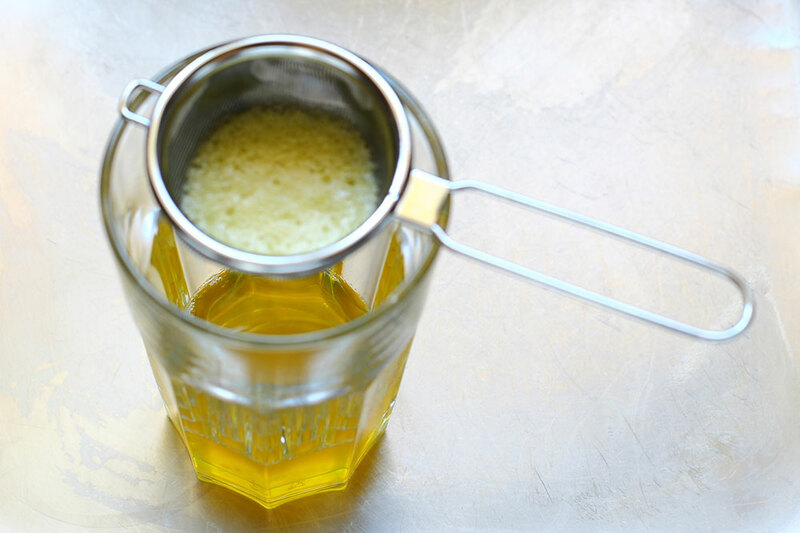 Clarified butter is unsalted butter that has the milk solids and water removed so all that remains is pure liquid golden-yellow butterfat. The advantages of this type of butter is its long keeping quality (several months refrigerated) and its high smoke point (can be used in frying without burning). 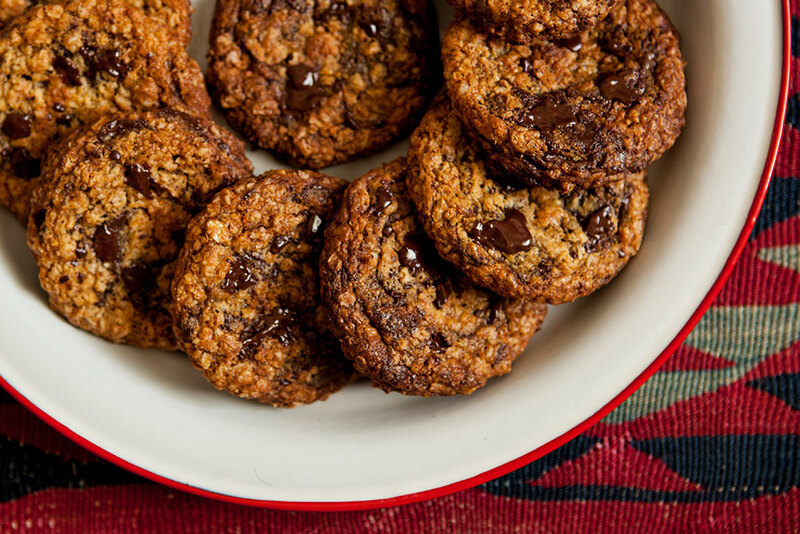 In this recipe, we want it for its distinctive fragrant nutty flavor. Gently melt unsalted butter over low heat until the butter breaks down. The water in the butter will evaporate, the milk solids will sink to the bottom of the pan and froth will rise to the top. The top layer, which is a white foam or froth (the whey proteins) should be skimmed off. This is usually done with a spoon, but I find that a fine-meshed strainer works best. If you don’t have a fine-meshed strainer, you might also use a double layer of rinsed and squeezed cheesecloth over a regular strainer. I couldn’t help but add a pinch of cinnamon to the chocolate ganache. When you taste it, you don’t go “Hmm, cinnamon”, but it’s there. 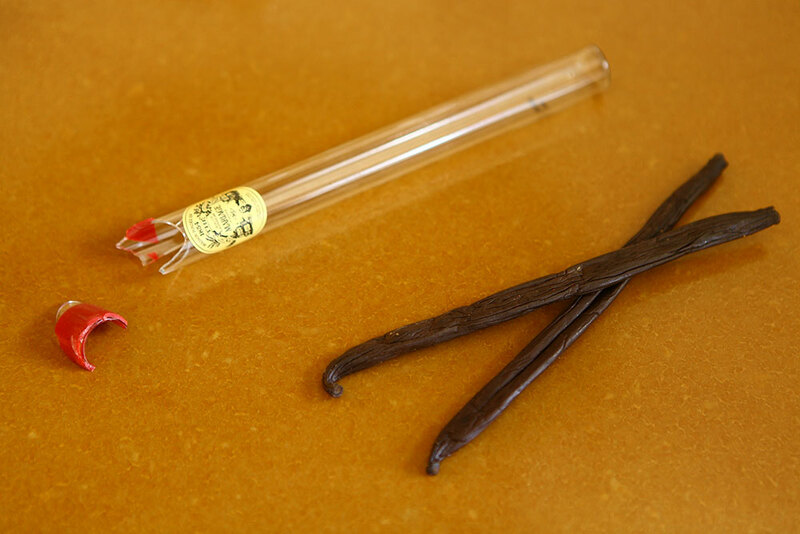 I also have to mention these Tahitian vanilla pods I bought from Mariage Frères in Paris. 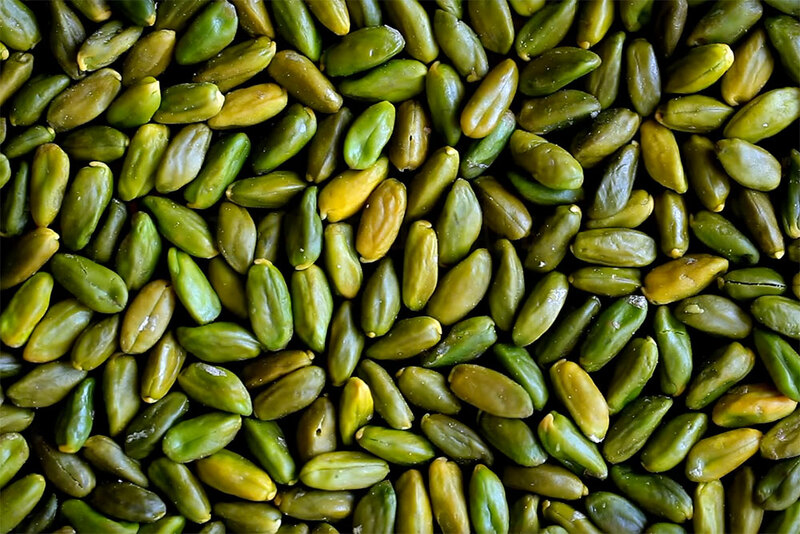 The plumpest, moistest, most fragrant vanilla pods ever. You scrape half of a Tahitian vanilla bean, mix it with sugar and mango puree, and this is how it looks after cooking them together for a few minutes. 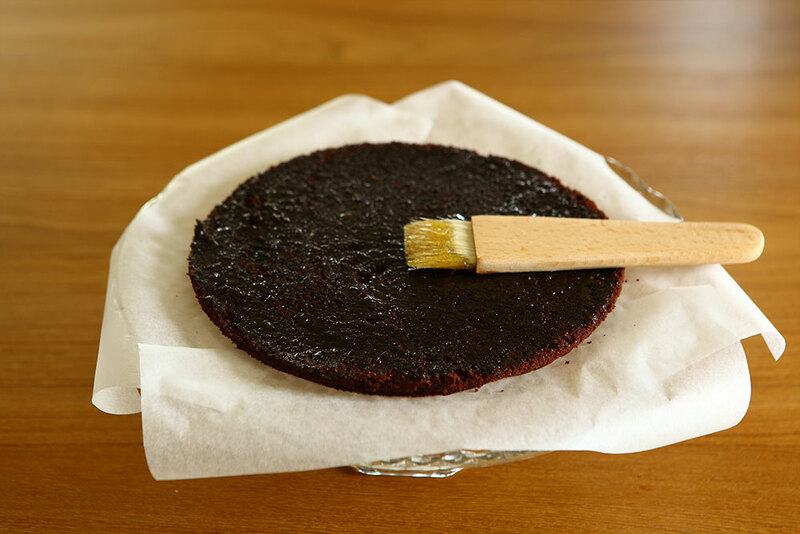 Below are step-by-step pictures of the assembly of the cake. Hope you enjoy. Recipe adapted from Baking with Julia by Dorie Greenspan. 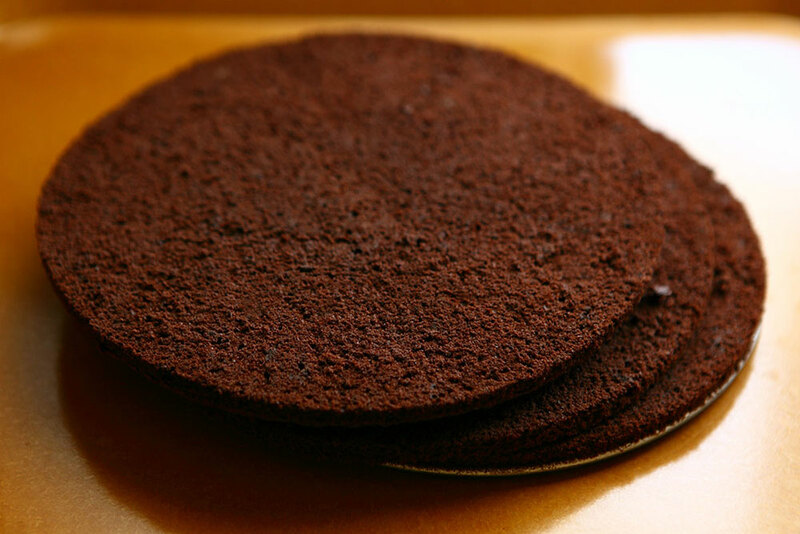 Fit the bottom of a 9-inch round cake pan, one at least 2 inches high, with parchment paper and set aside. Sift the flour and cocoa together three more times and set the sifter on a plate and return the dry ingredients to the sifter. Keep at close hand. Whisk eggs and sugar together in the bowl of a heavy-duty mixer. Set the bowl over direct heat or in a pan of barely simmering water and heat the eggs, whisking constantly, until they are warm to the touch. Working with a heavy-duty mixer fitted with the whisk attachment beat the eggs at high speed until they are cool, have tripled in volume and hold a ribbon when the whisk is lifted. Sift one third of the dry ingredients over the eggs and fold in gently. Fold in the rest of the flour-coca mixture. 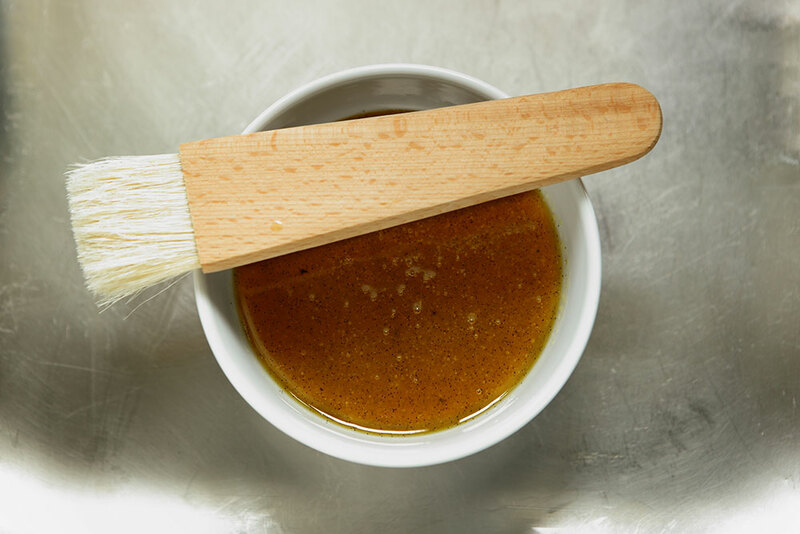 Mix hot clarified butter and vanilla extract in a bowl, spoon about 1 cup of the batter into the mixture and fold together until well blended. Spoon this over the batter and gently fold it in. Spoon the batter into the cake pan and bake for 25 to 30 minutes, or until the top of the cake springs back when pressed gently. Transfer to a rack and let cool. 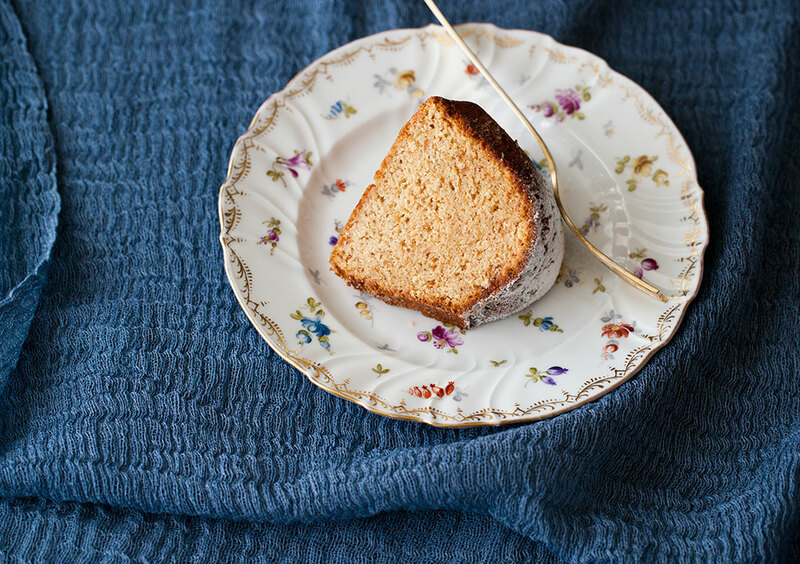 You can keep the cake (wrapped well) in the refrigerator for up to 2 days or frozen for up to 3 months. Thaw, still wrapped, at room temperature. Recipe adapted from Rose’s Heavenly Cakes by Rose Levy Beranbaum. In a heavy saucepan, whisk the yolks, sugar and butter until well blended. 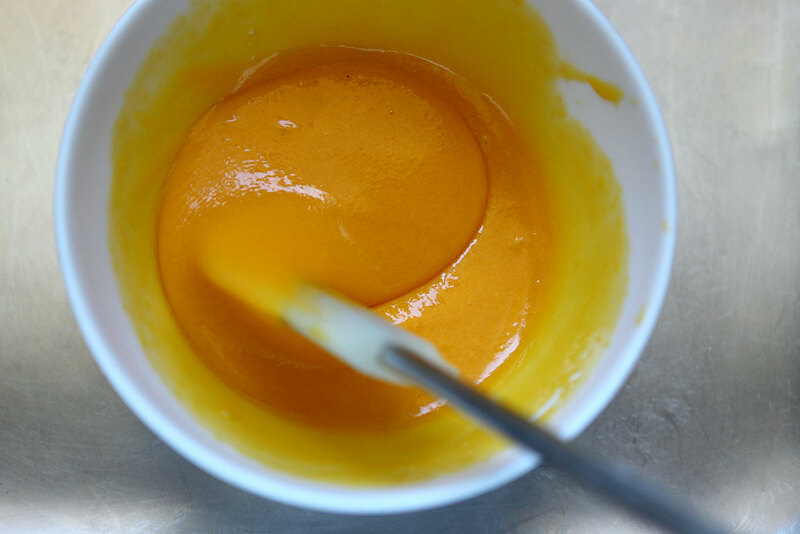 Whisk in the passion fruit puree and cornstarch. Cook over medium low heat, stirring constantly with a silicone spatula until thickened and resembling hollandaise sauce, which thickly coats the spatula but is still liquid enough to pour. Warning: Do not let the mixture boil. Whenever steam appers, briefly remove the pan from the heat, stirring constantly to keep the mixturre from boiling. Pour the mixture into a strainer and press it through with the spatula. Stir in the mango puree and allow the curd to cool for 30 minutes. Cover tightly and refrigerate for about 3 hours. It will keep for 3 weeks. With a small sharp knife, split the vanilla bean lengthwise in half. Place sugar in a small saucepan. Scrape the vanilla beans into the sugar and rub them in with your fingers. Add the vanilla pod to the pan. Stir in 1/2 cup of the mango puree until all the sugar is moistened. Bring mixture to a rolling boil, cover and remove from heat. Transfer it to a measuring cup, stir in the remaining 2 tbsp of the mango puree and let cool completely. Remove vanilla pod just before applying the syrup. 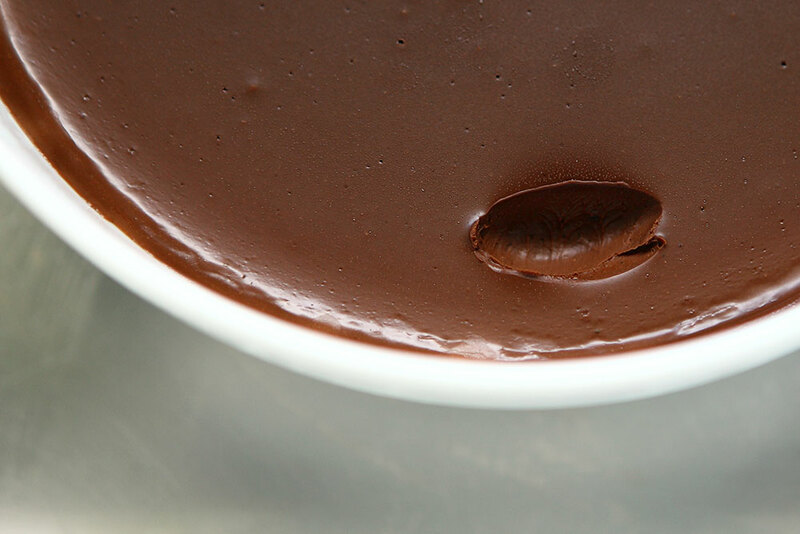 Place chocolate and cinnamon in a large mixing bowl. Bring the heavy cream to a boil and pour over the chocolate. Let stand for a minute and then stir with a spatula until the chocolate completely melts. Let cool at room temperature, cover and transfer to the refrigerator to thicken. Let stand at room temperature for an hour before applying. Mmmmmmm.. that is all I can say 🙂 not fair just seeing it on screen. Stunning, as always. I’m not generally a fan of fruit with chocolate, but I think the high-voltage zing of passion fruit might work very well indeed. That combination of mango and passion fruit in a curd is just irresistible! I love the flavor of both fruits and I just can’t imagine how delicious this cake must have tasted. Well done! Am always on the look out for inspirational recipes that are outa the box and here i am..sure gotta get around this one and the mango season is jus around the corner and i love the flav of local ‘illara’ mangoes….. Fantastic step by step pics too…. Greetings from Cape Town. Great idea putting the paper round the cake when icing it. One could use the bits cut off when lining the cake tin. It’s ABSOLUTELY gorgeous!!! Love the plate, too!! I bet it was really YUM! Have a nice weekend, Cenk! Dear Cenk, when I read recipes with a couple of steps to follow for sure, I can not help remembering a friend of mine who keeps saying if a recipe guides her like “on the other hand do this, do that”,she stops making it:))),this makes smile all the time,just wanted to share it with you. 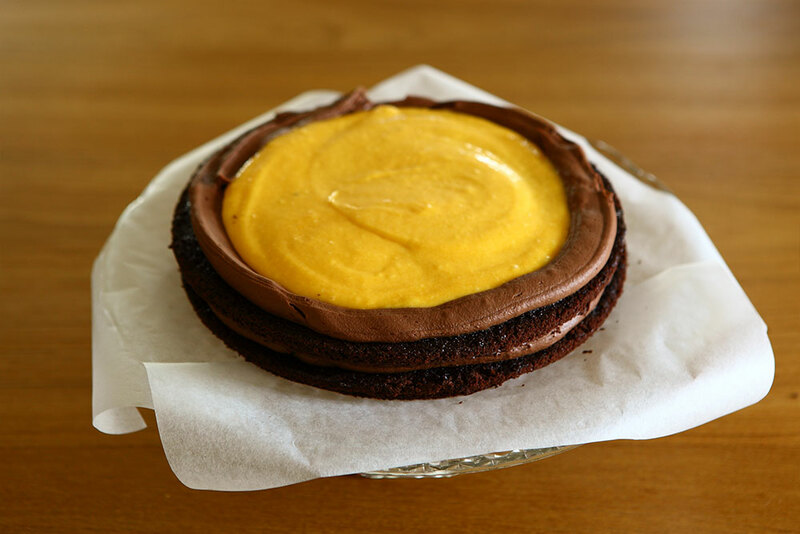 Last year I experimented with a mango chocolate cake. 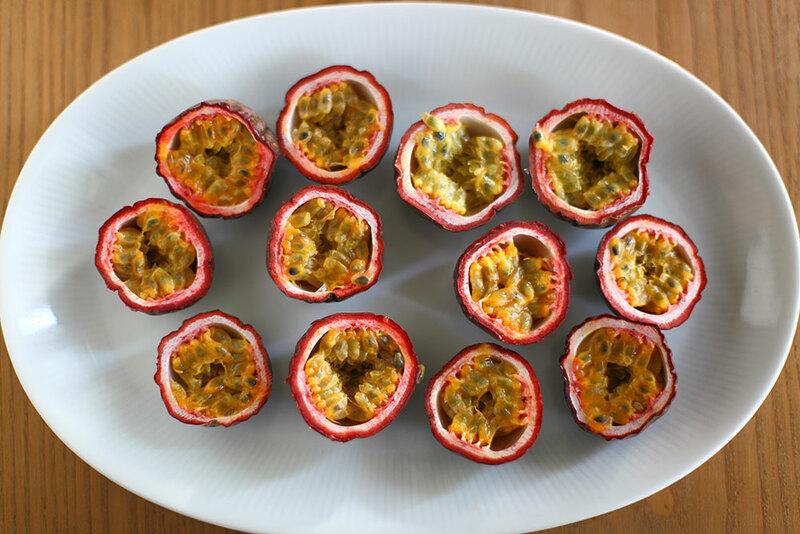 I love the added dimension of passion fruit. Bookmarked. Thanks so much for the step by step tutorial. 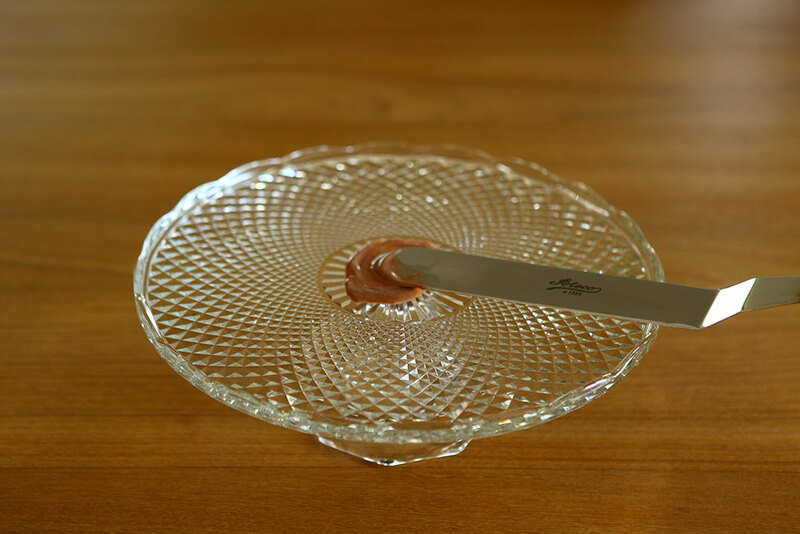 I always wanted to know how to get a really smooth ganache. That layer of oozing curd surprise is so inviting. I want to eat the cake now. Incredibly clear-cut! Great job Cenk! What a gorgeous looking cake and it sounds simply delicious! This looks like something out of a pâtisserie! Utterly gorgeous. I love the flavours and how beautifully it’s all been brought together.This is my first view of how passion fruit look… enticing. I do love Alice Medrich’s way with flavours. Passionfruit + chocolate is my new favourite combination. I just can’t get enough of it – especially passion fruit truffles.. oh my! Now I’m going to try this cake.. This cake turned out beautifully! I love the mango + chocolate combination, it sounds so unbelievably decadent with just a hit of tang! I am definitely looking forward to trying out this recipe! Just a couple of questions about the cake. Can you use self pureed mango? And how long does the cake keep in the fridge after its made? chloe – Yes. In fact, I pureed the mango myself. It will keep fresh for 2-3 days. Jaden – I am doing great! I miss chatting with you, too. I’ll do a post about one of your dishes from your wonderful cookbook soon. Hey Cenk! How are you? Gosh, I miss chattin’ with you so much. Beautiful post, as always. This looks deliciously sinful. How do you prevent the filling from oozing out when you slice into it and serve it? 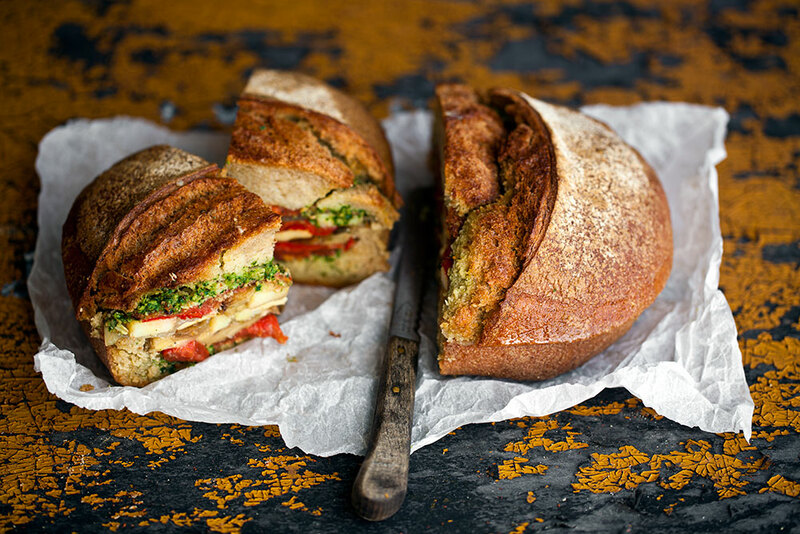 Bread and Beta – It oozes out only when it sits for a while after you slice and serve. As long as you serve it cold, right out of the refrigerator, there’s no problem. Alternatively, you may want to thicken the curd further. I didn’t go that route as I didn’t want to sacrifice from flavor. Hello from Bordeaux… Thanks so much for the recipe. I’ve made it the other day for my friend’s birthday. I got lots of compliment. Thanks to you 🙂 I will make it again for tomorrow lunch. This is already one of my favorite cakes besides raspeberry+whipped cream+choco ganache. One question: how long the mango syrup can be kept in the refrigerator? Can I use the one I made it 3 weeks ago?I found the mango syrup is a big quantity. Thanks. Ryma – Glad to hear you liked it! I don’t think the mango syrup can be used 3 weeks later. If you had frozen it, I would have said yes, but I am not so sure after 3 weeks in the refrigerator. I’d say taste it first and then decide. Thank you for the recipe. The cake looks incredible! 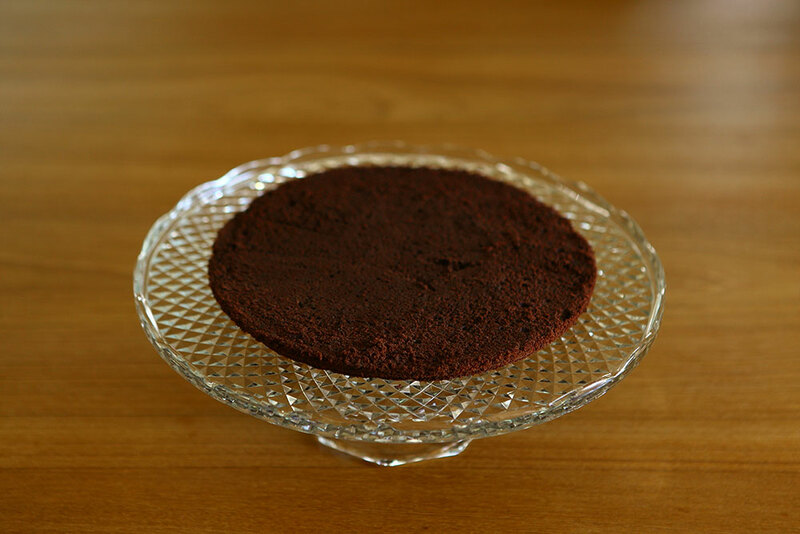 I’ve tried baking the chocolate genoise according to the recipe twice but the center of the cake sank during both attempts. I was wondering how tall your cake ended up (prior to the slicing). SHF – I think it was a bit taller than an inch. The key is to fold as little as possible when you add the dry ingredients. In my experience, when you’re baking a genoise, the center of the cake sinking is usually related to high temperature. You need to give the cake enough time to rise slowly. If you bake it at a very high temperature, it rises immediately and since there are no leavening agents supporting the batter in this type of cake, the center sinks. You might want to check your oven temperature; it might be baking at a temperature much higher than it shows. Hope this helps. I think that is THE most delicious looking thing I’ve ever seen on a food blog. I’m too terrified to attempt it, but well done for creating such a beautiful cake. 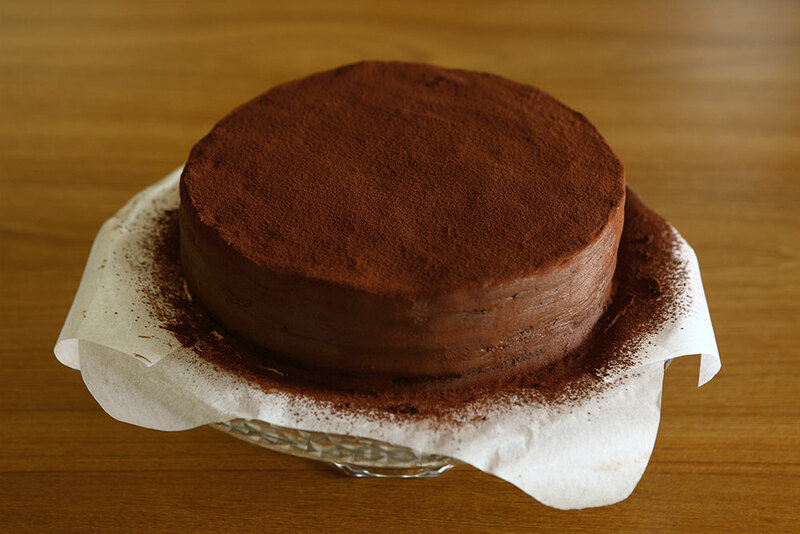 I just came across your blog today, and found this genoise recipe. 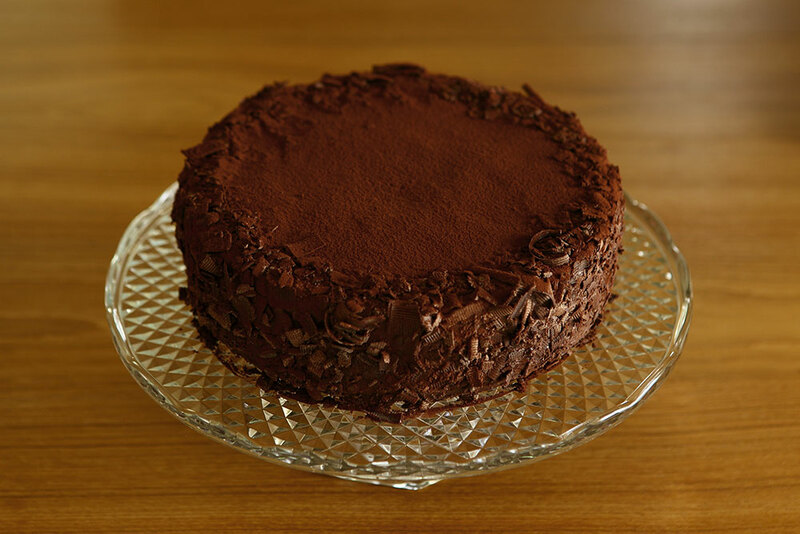 I’ve been on the lookout for chocolate genoise recipes recently, so I had to give it a try. It turned out well, even though I used a smaller pan (8 1/2″) and it is a good 2″ high. The thing I love about the genoise recipes I’ve tried (and I’m not sure if this is the same with all genoise) is that it always rises perfectly even across the entire top. Now I have something to use up leftover black ganache! everything is just perfect! Could you please post also where to buy these all ingidents while staying in Turkey. wow! !very irresistible! nice to meet you..your blog is very beautiful and helpful for me. Just tried your recipe for my wife’s birthday. All went alright, but the actual cake. No baking powder?! I ended up doing two cakes because the first was not thick enough to slice into 3. The second turned out worse. End of story, my wife did not get her cake. But I’m not giving up. Tomorrow I am baking a “normal” chocolate cake (Swedish recipe) and I will complete what I started today. I would appreciate a comment on the baking powder though. Luca – Sorry to hear things went wrong. Genoise takes a bit of practice. There’s no baking powder in the traditional genoise recipe. You incorporate air by whipping the eggs with sugar (heating them beforehand allows the bubbles in the foam to expand and the albumin in the eggs stretches into a web and holds these bubbles captive). The most important part is the folding of the rest of the ingredients. You must do it very gently to keep the bubbles you created. 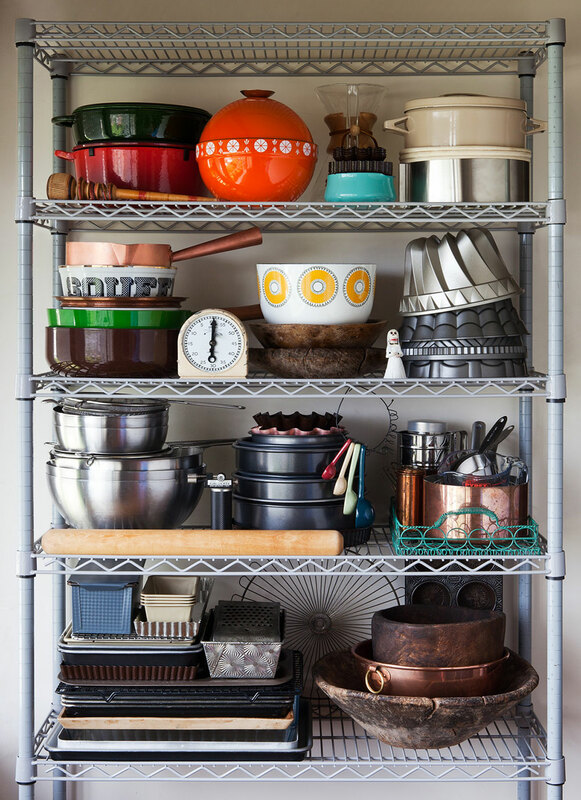 All this will yield a cake with a strong crumb that can hold every kind of filling. You may wish to try another recipe or just add half a teaspoon of baking powder to the above recipe to help you along. Hope you get a better result next time. I can’t wait to bake! Jasper – 2+1/4 cups of heavy cream is 515 ml or about 500 grams. The heavy cream I use has %35 fat. You might want to check the label. Hope your friend likes it! i was just looking for a recipe that involves lotsa egg yolks + passionfruit and seems like i’ve arrived at the most right place. 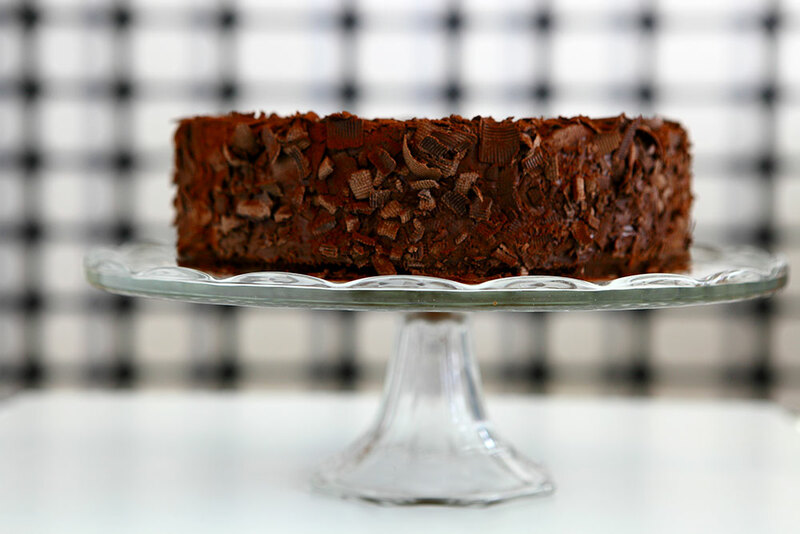 your cake looks DECADENT i’m so so so gonna bake this! thanks a lot for the recipe! Hi, how much curd does the recipe make? I’m thinking of swapping either lemon or orange curd instead of the passionfruit mango (it’s hard to get fresh mangoes here! 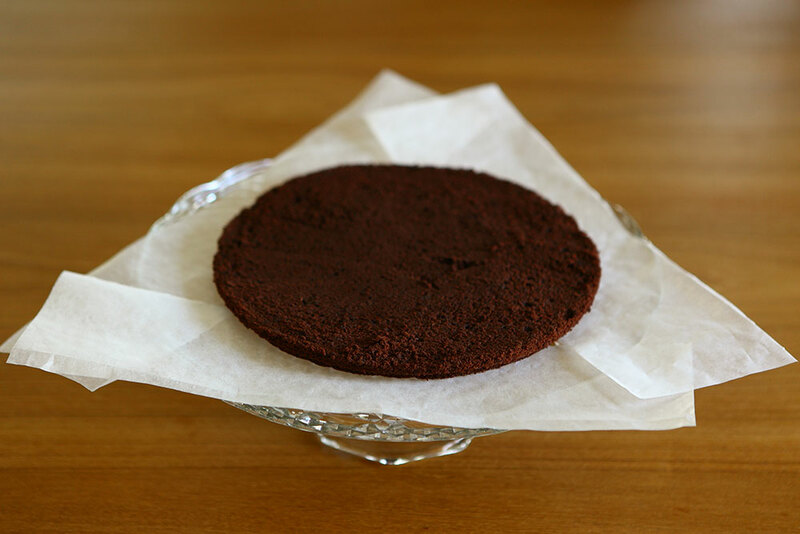 ), and I have a curd recipe I use so would like to know how much I need to make for this cake. Melissa – The yield is a bit more than a cup. You are amazing! Thank you so much for posting this recipe, it was delicious!! i love passion fruit and chocolate, it was definitely like a Mogador macaroon. 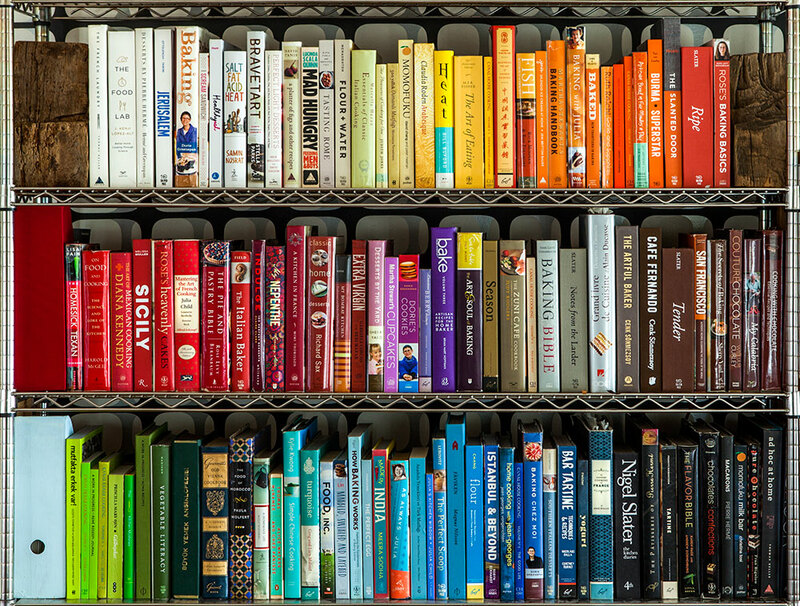 Congratulations on your exquisite blog and your upcoming cookbook. 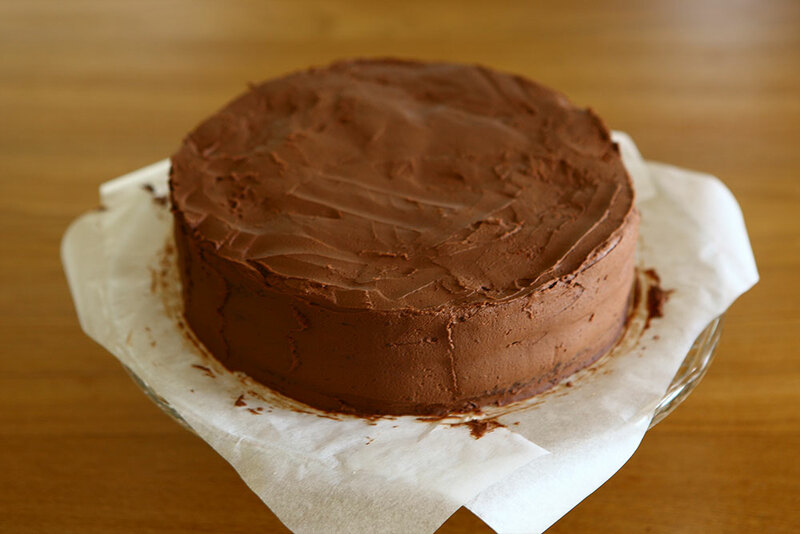 This may be a stupid question, but does the ganache cake recipe make enough for all three layers, or for just one layer? Your blog is really lovely. Your homesickness for San Francisco reminds me of how I felt when I left Paris a few years ago. I had a tiny studio in the 7th arrondissement- so beautiful. I’ve been in bread withdrawal ever since. 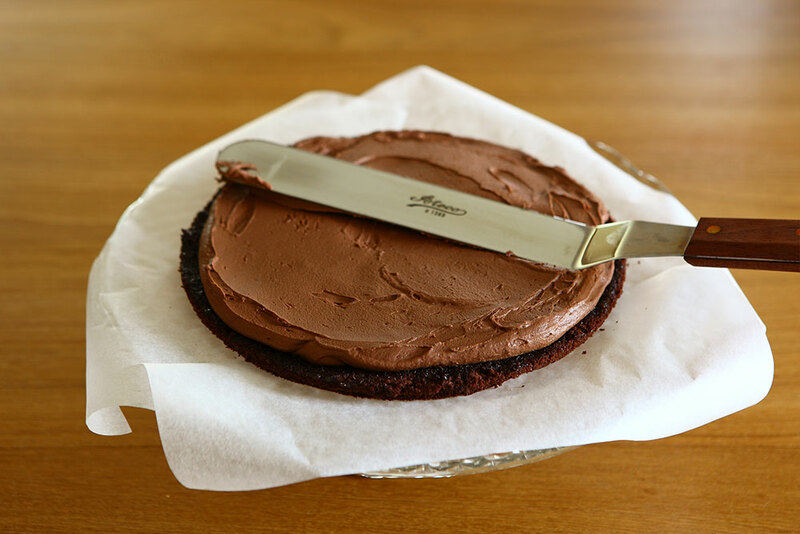 Stella – The recipe makes enough ganache for the whole cake. Thank you! Oh sorry- my bad, I meant to ask you how much genois cake is the recipe going to make- will it be enough for three layers, and do you bake them all separately or do you bake one and slice it in three? 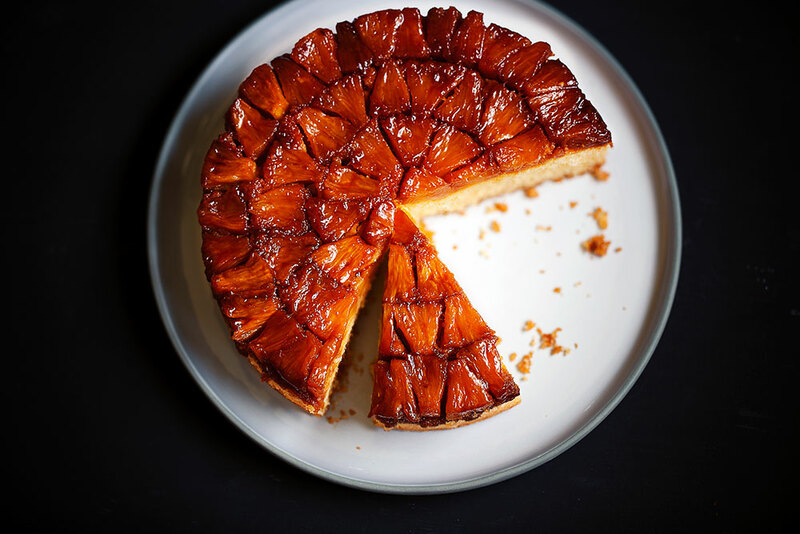 Stella – As you can see from one of the photos, I baked the cake and sliced it into three. Hi, your blog is amazing! In your experience, should this cake be assembled on the day it is eaten or the day before? How long will it keep? Neta – Thanks. It is best on the day you assemble it and will keep for 2-3 days in the refrigerator. Hello Cenk, I love your recipe and I am going to make it tomorrow for my friend’s B-day. What is the best way to cut the cake in 3 layers? 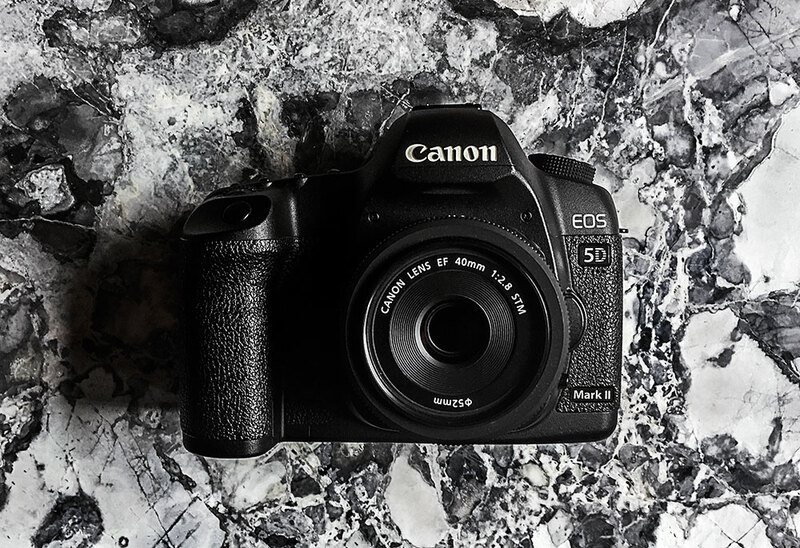 Viki – With a cake breaker! Just a few questions… How do u cut the cake into three even layers (without the cake breaker) and can u make the mango purée and passion fruit purée yourself? Thanks in advance. Moo – I cut them with a large serrated knife. Yes, I made the purees myself. Just cut the fruit and puree with a handheld immersion blender (or in a food processor). I made this cake for my sons birthday 2 years ago as he adores mango, , passion fruit and chocolate! birthday coming up again next week and yet again the special cake request is fo another of the same…not bad for a 13 year old.. Thank you for making the recipe so easy to follow for somehiing that is a tad more technical to do. I loved baking this. The cake looks amazing and I’d love to give it a try. However, I cannot access the photo gallery to see how to assembly it :(, it only shows the first photo. Could you, please, have a look at it? Thanks a lot! Cristina – There was something wrong with the gallery plugin. I fixed it. Happy baking!